Cabbage root maggot (Delia radicum) flies are delicate, hump-backed gray-brown flies, about 5-7 mm long. Onion, seedcorn and cabbage maggot flies are difficult to distinguish with the naked eye, but each will only be found on and near their appropriate crop family. Small (⅛”), white, bullet-shaped eggs are laid in soil. Maggots are white and legless and can be found in and around roots. Life cycle. Cabbage root maggots overwinter as small brown pupae in the soil near roots of fall brassica crops where the larvae fed. Adults emerge in spring and can travel up to a mile in search of host plants. 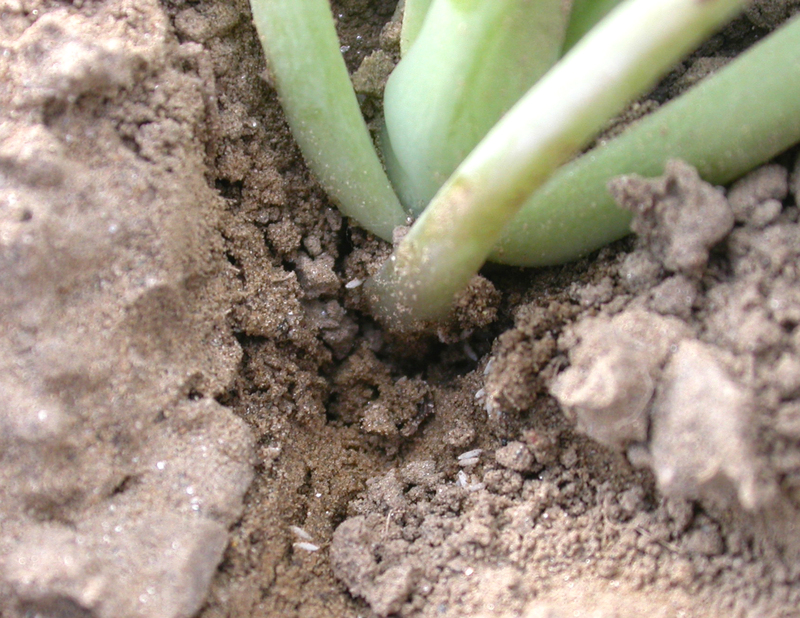 Eggs are laid in the soil at the base of the stem of host crops. Cool, moist soil conditions favor survival of the eggs, and soil temperatures that exceed 95°F in the top 2-3 inches will kill them. 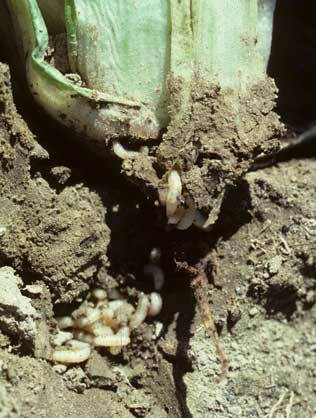 Larvae feed on roots and pupate in the soil. A late summer flight (late August, early September) may damage fall root crops. There are 3-4 generations per year in central New England. Onset of Spring Flight. A good indicator of cabbage maggot flight is blooming of the common roadside weed, yellow rocket or wintercress (Barbarea vulgaris); good photos can be found at the online UMass Weed Herbarium. Cumulative growing degree days (GDD) and indicator plants can be used to more specifically pin-point activity of cabbage maggot fly in your area. Many GDD models are base 50°C, but because cabbage root maggots are active at lower temperatures, GDD models should be base 4°C. NEWA has cabbage maggot models and growing degree day information here. Choose your state and the weather station closest to you. The resulting report indicates daily and cumulative GDD using the base temperature 4°C. Brassicas grow well in cool spring conditions and need an early start to reach maturity at the desired time. However, this leaves them vulnerable to the spring flight of cabbage maggot flies. Being aware of when spring flight occurs and being proactive with preventative control measures are key to getting the crop through the May flight period. Larvae feed on roots and can completely destroy the root system. The first sign of a problem is wilting of the plant on sunny days and yellowing or purpling of outer leaves. Later, plants collapse, wilt down, and die. On inspection of the root area you may find the legless white maggots feeding, the small brown, oblong pupae, or tunnels from maggot feeding. In brassica root crops such as turnips, radishes, and rutabaga, maggot feeding tunnels on or in the root render it unmarketable. Monitoring for adults. Yellow sticky cards attract adult flies and can be deployed in or slightly above the canopy (see photo at top of page). Check and change cards every 3-5 days. Monitoring for eggs. 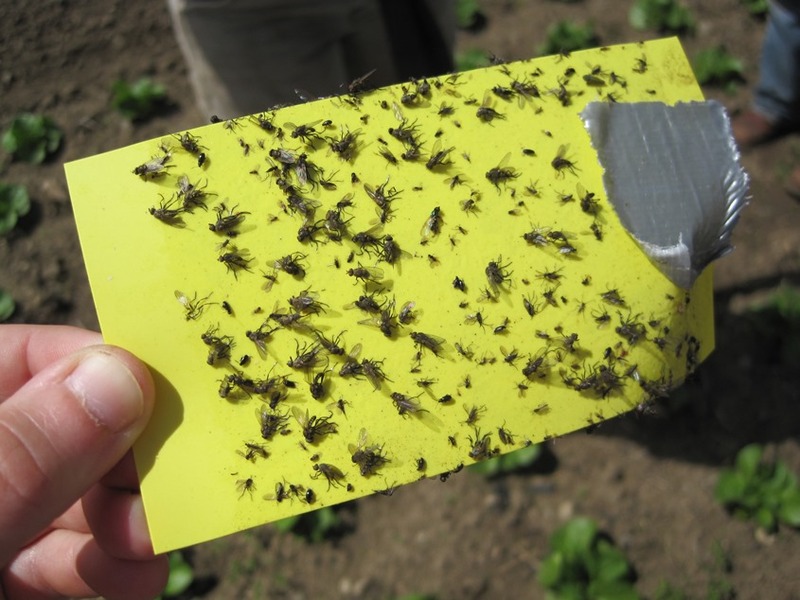 If you have transplants hardening off in a cold frame or outdoors, flies may find them and lay eggs in the flats. To check for eggs in the field or in flats, look for the ⅛-inch long, torpedo-shaped white eggs that are laid along the stem, or in and on the soil near the stem of young transplants. A pencil point or knife helps stir the soil to look for them. Field scout by checking 25 plants, in groups of 2-5 plants, scattered around the field. If you find an average of 1 egg/stem or more, significant crop damage is likely. Eggs may be more abundant in wetter areas of the field. Egg numbers may build up rapidly after the first eggs are seen. Scout successive plantings. Apply a soil drench 2 to 3 days after finding an average of one egg/plant. Rotate crops to keep maggot populations low; greater distances are more effective. Rotate spring crops to fields that were not planted with fall brassicas. Delay planting until after first flight is done (usually mid-May, depending on GDDs) and soil temperatures are high enough to kill eggs (95°F). Planting in late-May into June is generally safer than in the first half of May. 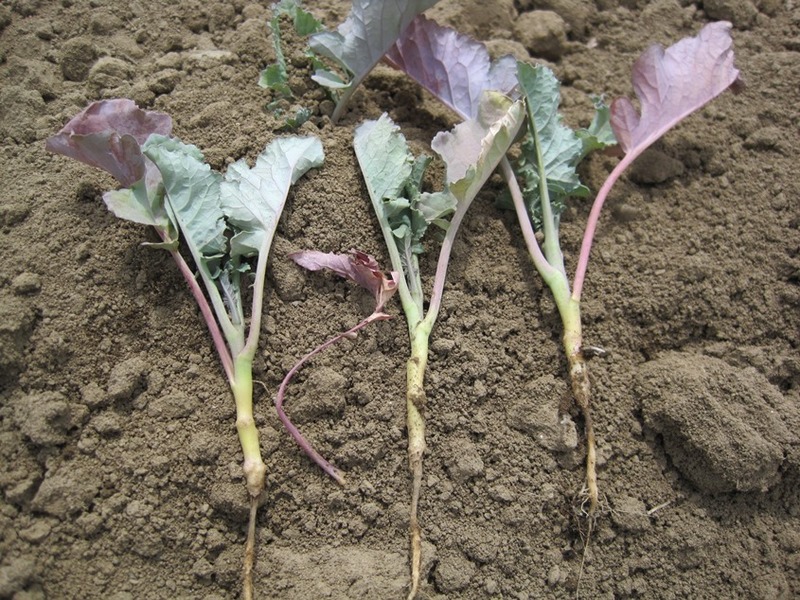 Cultivate vigorous brassica crops so that soil is brought up around the stem to encourage adventitious root formation. This can help compensate for root loss even if maggots are present. Till under fall crop residue to expose and help reduce populations of overwintering pupae. Scout each successive seeding or planting to determine whether treatment is required. Cabbage maggot eggs are very sensitive to high soil temperatures (above 95°F), and will die if they are exposed to these temperatures for several days in a row. Generally these soil temperatures are reached by late May/early June, unless there has been excessive rain, which has a dramatic cooling effect on the soil. This means that under high soil temperatures there is no need to spray for this pest. Ecotrol G is a plant-based granular with several aromatic oils that may have repellent effects against cabbage root maggot. It is allowed in USDA certified organic production. This product is exempt from pesticide registration and so does not have an EPA number of official label. Natural enemies. Soil-dwelling beetles, including ground beetles (carabids) and staphylinid beetles, feed on cabbage maggot eggs, larvae, and pupae and can cause high levels of mortality. One staphylinid species, Aleochara bilineata, also parasitizes maggot larvae and has been shown to respond to chemicals given off by plants that suffer maggot damage. Because these soil-inhabiting beetles are susceptible to insecticides, broadcast soil insecticide treatments should be avoided. Other natural enemies including parasitic wasps and predatory mites. Naturally-occurring fungal diseases occasionally will reduce onion maggot numbers, particularly when flies are abundant and relative humidity is high. During a fungal epidemic dead, diseased flies, can be seen clinging to the highest parts of plants along field edges. Nematodes for biological control. Soil application of the entomopathogenic nematode Steinernema feltiae has shown efficacy against cabbage maggot in trials even at low soil temperatures 50°F/10°C). Apply by suspending infective juvenile nematodes in water and treating transplants prior to setting in the field (as a spray or soaking drench), or in transplant water used in the water wheel transplanter, as a drench after transplanting, or a combination of pre-plant and post-plant applications. Post-plant treatments are likely to be needed if maggot flight begins >1 week after transplanting. Rates of 100,000 to 125,000 infective juveniles per transplant have been shown to be needed to achieve reduction in damage. Nematodes need a moist soil environment to survive.